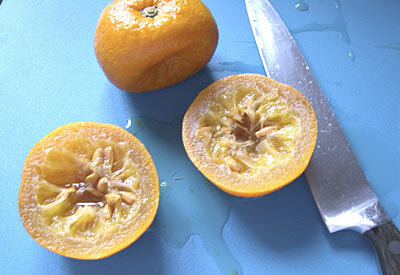 Oranges require long cooking at the outset to soften the peel and this method poaches the fruits whole. It is then a cinch to scoop out the insides with a spoon and easy to chop the peel, though still a time consuming part of the job. It is unlikely that the mixture will fill every jar right to the brim so include a few smaller jars when readying them so none of the marmalade is wasted. See Jam Basics for general jam making tips and information. Wash the whole fruits and place in a heavy lidded casserole or a preserving pan that will fit in the oven. Pour in the water and bring to simmering point on the hob. Cover or if using a preserving pan make a lid to cover the top with tin foil before placing in a 180 C (350 F) Mk4 oven. Poach the fruit for 2 1/2 -3 hours by which time the skins will be softened. Using a spoon, lift the fruit out of the liquid into a colander over a bowl and leave to drain and cool. When the fruit is cool enough to handle, cut each in half and scoop out the insides with a spoon to leave just the peel, placing all the flesh, pith and pips in a muslin bag or a large piece of muslin over a bowl which you can gather into a bag. Collect all the juice as you go and add it to the poaching liquid. Measure the poaching liquid and make up to 1 litre (2 pints) with water if necessary. Place the muslin bag in a pan with enough poaching liquid to cover and bring to the boil and simmer for 15 minutes. Leave till cool enough to handle then squeeze the bag to get as much of the liquid as possible from the pulp. Discard the bag and its contents. Chop the peel into thin strips. Place all the liquid together into a preserving pan with the cut peel. If the mixture is cold you can now add the sugar without warming it, otherwise you will need to warm the sugar in the oven first. Stir the sugar into the orange liquid over a low heat until the sugar is completely dissolved and the liquid is clear. Turn up the heat and let it boil rapidly for 15 minutes then test for setting point. Continue to test every 5 minutes or so until setting point is reached. It shouldn’t take more than 20 – 30 minutes. Turn off the heat and leave to stand for 15 minutes then stir to distribute the peel. A small knob of butter stirred in will make any scum disappear or you can spoon it off if you find it unacceptable, but it is a shame to waste any. Pour into hot, clean sterilised jars, put waxed paper circles wax side down on each one and seal immediately. Label when cold and store in the larder.